Working it out on the longe. We’ve continued to have some seriously variable weather lately – last week we started with pouring rain and temperatures in the 50’s, only to have a 40 degree drop over one 24 hour period, plunging us back into the deep freeze. We’ve had some silly equine behavior to contend with, but for the most part, Derby has been fine, despite the fact that he and Remy aren’t moving around much at all in their turn out. They’re smart boys – there are some slick spots out there. Our rides have been similarly up and down. We’ve had some really great ones, and then some others that were marked by tension. Saturday I didn’t ride at all, because he had a case of bats in his belfry. Between lack of exercise and sharply cooler weather, my usually cool cucumber was totally wired, spooking on the longe line the ice falling off the roof and the barn doors opening. Though I was disappointed that I didn’t get to ride, I did take the opportunity to do groundwork. Here’s a video clip of some of the longing. I was pleased that despite his enthusiasm, Derby was also listening, allowing me to half-halt him with my voice, and doing nice upward and downward transitions. However, midway through the video, you see one of the spooks, and he takes off in a spectacularly awful canter, with different leads fore and aft. Sunday was a weird day, marked by a sad turn of events when an elderly retiree died suddently in his pasture. Though it appeared that he went quickly (not 45 minutes after I had walked by him and said hello on my way to fetch Derby), it was still upsetting, and then there was the unsavory task of moving the deceased from his paddock to the front drive for the livestock removal folks. I didn’t want to be mounted while all that was going on next to the arena, so Derby enjoyed a flake of hay after I tacked him up. We ended up having a pretty decent ride, but nothing earth-shattering. I still rode tentatively and Derby was offering bucks when I touched him with the whip or my pencil-eraser sized spur. Before my lesson last night, I had Christy check his back, because I was getting to the point where I didn’t trust myself anymore. 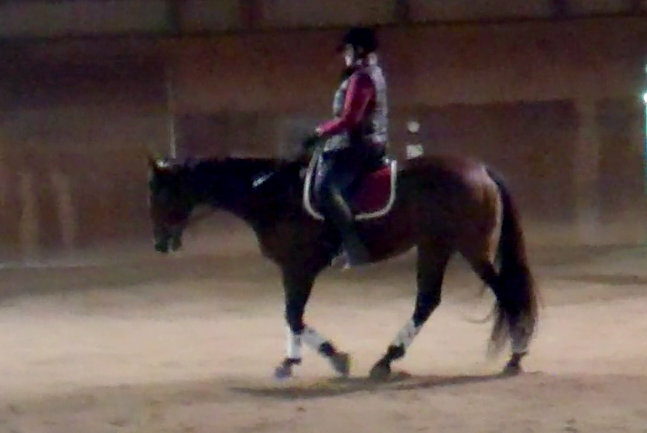 He’s seemed a bit back sore at lately, and I tried a variety of pad and saddle combinations on him to little avail. I’ve been waffling back and forth, wondering if some of the issues around resistance and cooperation were a symptom of some saddle fit issues, or a symptom that would be best remedied by some wet saddle pads and a good thwack on the rump every now and then. Christy removed my doubts. She poked and prodded, and as she increased the pressure, he yawned and stretched his neck. He thought he was getting a massage. Wonderful. I got on, feeling much better now that some uncertainty had been removed. And Derby sensed it right away, setting of in a marching walk, and offering no foolishness. 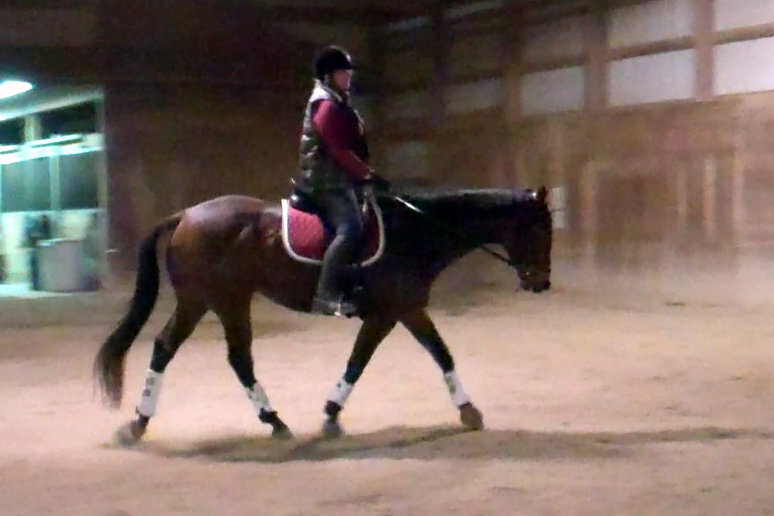 While we warmed up, we worked on my position and my bad habit of letting my reins get long and then pulling them toward my hips. The issue du jour for me is carrying my hands properly. To this – a much nicer, more engaged walk. We then moved to trot, still focusing on throughness and activating Derby’s hind legs, while requiring me to keep my hands where they belong. As I’ve witnessed before, the horse is absolutely willing to meet you halfway when you get your position right. Derby was moving happily and was nicely over his back. 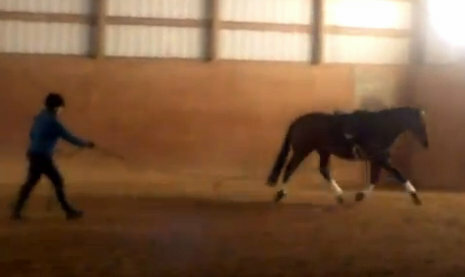 It’s in moments like these that I really understand what we’re talking about when we refer to harmony in dressage. Suddenly, things become easy when you’re in balance and harmony with the horse. Hands forward, over the withers, where they belong. It was a really nice ride, and I hope to build on it tonight. However, we have whiteout conditions today, with high winds and snow. Awesome. I can’t wait for spring! Yesterday the Chicago area flirted with record high temperatures, reaching 66 degrees. Wind and lots of rain also visited the area. But what a difference a day makes. Right now, temperatures are headed down to 10 degrees, and snow is covering the ground. The horses have been in for a few days, and between the chaotic weather and being trapped inside, they’re starting to get a little loony. 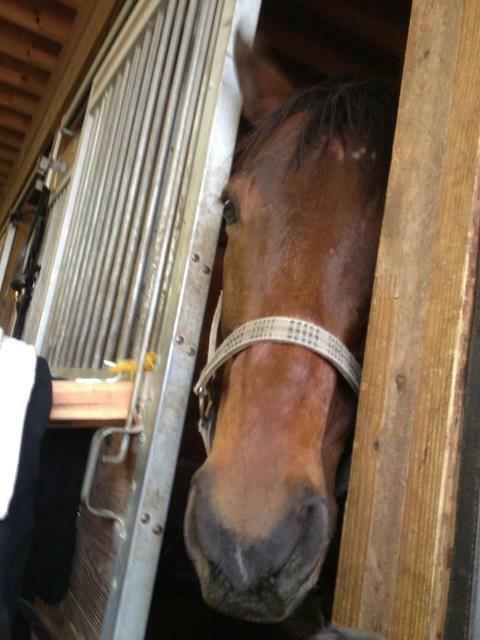 I was traveling Monday and Tuesday, and Derby wasn’t well behaved either day for the girl I had lined up to ride him. She’s a lovely rider (much better than me,) and normally they have great rides together. However, Monday he would not go forward – refusing to do anything but a shuffling jog, and Tuesday he had a puffy leg and a nick just above an eye, so he just got a hand walk. This morning I got up early to visit Derby before starting work. I suspect his puffy ankle is from an aggravated bed sore on the front of the fetlock. He’s sound and there’s no heat. The eye looks fine too, it’s superficial. I was relieved. In anticipation of riding tonight, I put Derby’s boots on for a little early morning exercise. Once we were in the arena, I set up a little X for him. He started taking himself over it even before I asked, and had a lot of fun jumping it both ways. 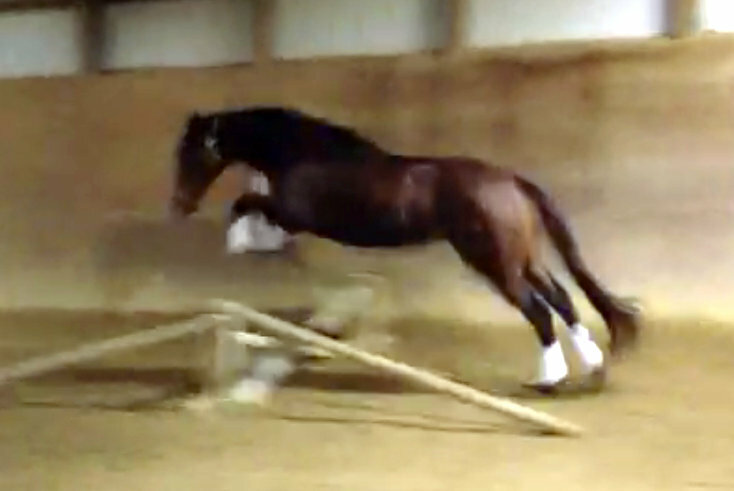 Not wanting to make himself sore, I took the X down before Derby was really ready to be done with it, turning it into trot poles which Derby then trotted and cantered. Afterwards, he got a long walk, a good currying and some cookies in his haynet to help him pass the time. 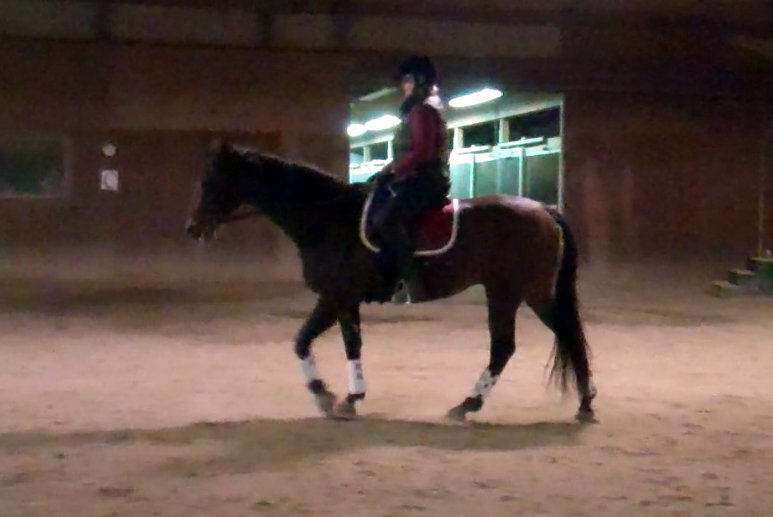 When I went to tack him up tonight, however, I noticed that his wither area was a bit sore. Not super bad, but not great, and given that he’d had some issues over the last few days, I left him in his stall, and went to fetch my good buddy Manny. During our lesson, Christy noted that my hands were staying nice and quiet, and I told her that I believe I finally have the “feel” for carrying my hands independently. Riding Tucker a couple weeks ago, I had a bit of an epiphany, and for the first time could really feel what I was doing in terms of following the movement with my seat but keeping my upper body and hands quiet. Since that ride I’ve been able to replicate it, so I hope this means that it’s officially a new habit. What produced this epiphany? It’s hard to nail down. 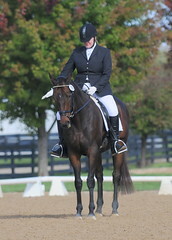 I have been doing the work, riding different horses and working on my seat, including dropping my stirrups. And I have been diligent about doing my homework, practicing what we work on in my lessons, and looking to the horse for feedback on how I’m doing. Ultimately, I think that I’ve become a good student, able to synthesize and apply what I learn from Christy. So yay. Progress! Just in time for some wicked cold that is threatening to keep us grounded tomorrow. We’ll see.